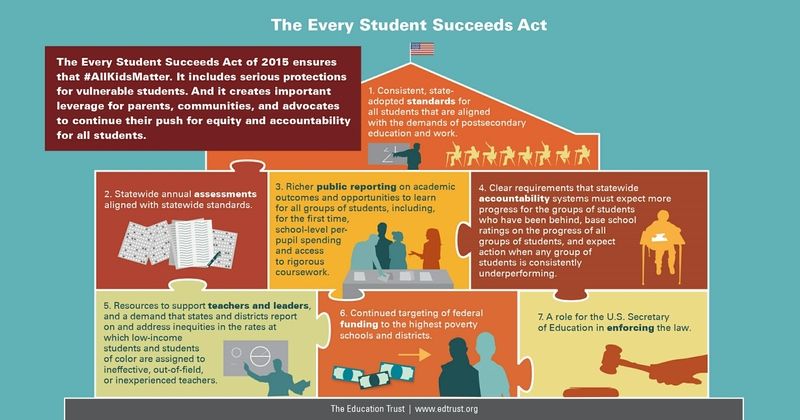 Here’s an EdTrust infographic about the seven key goals of ESSA. Thoughts on two of my favorite points are below the infographic. Point five and six are probably the most important. Five acknowledges that while parents play a huge role in their children’s academic development, ineffective teachers, consecutive ineffective teaching in particular teaching, is a huge problem in low income, minority school communities. Now, this isn’t to say I agree that three consecutive years of “good” teaching is sufficient to close the achievement gap. Nor does it mean that I’m in favor of punishing teachers who aren’t continuosly meeting academic goals. I entirely understand that there are many factors that play into how “effective” a teacher is. A lot of that lack of effectiveness has to do with a lack of effective professional development for teachers. What point five really highlights, to me, is the importance of mending this cycle that keeps the most disadvange students with the most ineffective teachers. A good start would be to track and follow how that cycle works, where it’s most pronounced and note any identifiable causes. This sort of leads into the importance of point six, which is continued funding to low income communties. Im not too clear on what this funding includes specifically, but hopefully there’s an emphasis on Title II funding, which supports teachers’ professional development.